Leading Manufacturer of Everest EVB 01 65 Mm Mechanical Vacuum Booster Pump, Everest EVB 05 65 Mm Mechanical Vacuum Booster Pump, Everest EVB 15 80 Mm Mechanical Vacuum Booster Pump, Everest EVB 30 125 Mm Mechanical Vacuum Booster Pump, Everest EVB 50 125 Mm Mechanical Vacuum Booster Pump and Everest EVB 60 200 Mm Mechanical Vacuum Booster Pump from New Delhi. Everest Mechanical Vacuum Booster Pumps, import substitutes, are used in growing number of applications where fast pump down times are required, and environment or energy usage concerns, rule out any alternative pump selection. 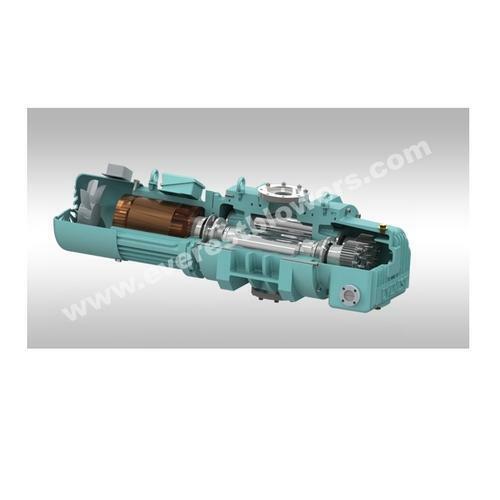 Everest Booster Pumps enhance the performance, ultimate vacuum and pumping speed of oil-sealed / water-ring / dry vacuum type of mechanical pumps, which are widely used in the industry. OPERATING PRINCIPLE : EVEREST Vacuum Boosters are positive displacement pumps with two figure eight shaped impellers rotating in opposite directions inside the casing. As each lobe of an impeller passes the blower inlet, it traps a quantity of air equal to exactly one fourth the displacement of the blower. This entrapment occurs four times per revolution. The entrained air is forced around the case to the blower outlet. Timing gears accurater position the impellers in relation to each other to maintain the minute clearances so vital to the high volumetric efficiency of the pump. Major Industries Served : Chemical and Pharmaceutical, Food Processing, Industrial Processing, Vacuum Furnace, Semi-conductor, Electrical and Lighting Industries. Boosts vacuum levels of backing pumps, thereby reducing process temperature. Boosts volumetric displacement, thereby reducing process time. Extensively Used For : Evaporative Concentration, Vacuum Distillation, Polymerization, Crystallization, Vacuum Impregnation, Vacuum Drying, Sterlization, Vacuum Cooling, Object MetaIIising, Roll MetaIIisation, Semi-conductor Processing, Manufacture of Vacuum & Microwave Tubes, Manufacture of GLS Automotive & Miniature Lamps, Tube Light Production, Sintering, Brazing, Electron Beam Welding, Heat Treatment, Ionic Nitriding, TooI Coating, Vacuum Casting, Degassing Refining, Plasma Welding, Evaporation, Sputtering, Space Research and Development AppIications. Best suited for all high vacuum applications.